To be human is to live in a sense of the future. Everything you do, you are doing because there is something you want. What you want, by definition, aims at something that is not here right now. You evaluate your present based on how close or far away it is to what you want it to be. Even when you are ruminating on the past you are doing so because, in some way, you are presencing what you don’t want to happen ever again (in the future). Everything you have ever noticed you noticed because it was either an obstacle to your desired future or afforded you to get closer to it. As you read this very sentence you are reading it because you imagine it will provide you something that will make your life better than it is right now. Whether you are conscious of it or not, as a human being, every moment you find yourself dwelling within this is-ought structure. It is both the structure of your reality and your way-of-structuring it. Perhaps you can begin to understand what the Buddha might have meant when he said, “Life is suffering.” Like it or not, aware of it or not, you find yourself always already in a moment that is exactly what it IS and never, not even once, has it been how it Ought to be. Yet part of the IS you always find yourself in comes haunted with the OUGHT that… well… ain’t. It is the inherent (and inherited) constraint that you suffer and at the same time has given you every possibility you have ever known. Yet there are ways of relating to this sense-of-future that can bring you great meaning, joy, and fulfillment, and ways that can bring you unending pain and suffering. Science, for all intents and purposes, has figured out exactly what gives human beings happiness. It is actually embarrassingly simple yet so un-Godly hard that only a very small percentage of the world population will ever come close to having even one second of it! Here is the formula: 1. Create a goal in an area of your life you and others you respect care about. 2. Take actions that are difficult and that sacrifice immediate pleasure in service of it. 3. Move closer to it. That’s it! With some thoughtfulness we can see why this formula works and why happiness is not a feeling but rather a skill. A skill at what? The skillful ability to experience your actions to be so meaningful that there is no question whether it is worth their suffering. In other words, when the “ought” becomes the inspiration of your actions rather than “what’s missing,” the skill of happiness is set into motion. Interested in coaching with Guy? Yet as simple as the formula for happiness is, it is easily triply as hard to pull off. Why? Simply put, the thing that grants happiness is the exactly the same thing that grants your misery — a self-recursive loop of meaning. What the f%ck?! 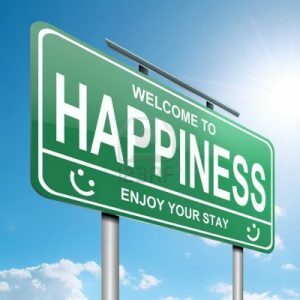 Given that the process that affords happiness is the same process that makes you a fat dude who can’t feel his emotions, what is the difference that makes this difference?